There is something in the trees, lurking, sees everything... .
Law of the jungle *2* . Arrrrgh, I don't really have anything to say, apart from the usual "This is awesome". I'm just writing this because I feel if commenting on something you favourite is the decent thing to do. So yeah, awesome stuff, looking forwards to more. the colors on tree are fab!! 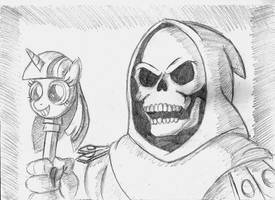 This is one of the most random pony pics I have ever seen. I know its Derpy, but... god dang it! I don't know, maybe because her eyes seem to look in different directions, so the idea with the poneleon came up^^. I have no idea how to react to this. Oh this is far to perfect! Cute and perfect! Derpy would make the best Chameleon! And that is what you call "happiness". Very awesome! Well, life is no bowl of cherries . Maybe she sniffed on some special plants and have a special dream now in her nap^^.